Three Bean Vegetarian Chili, also known as “Veg Head” Chili, is one of our favorite recipes to make during the cooler months. 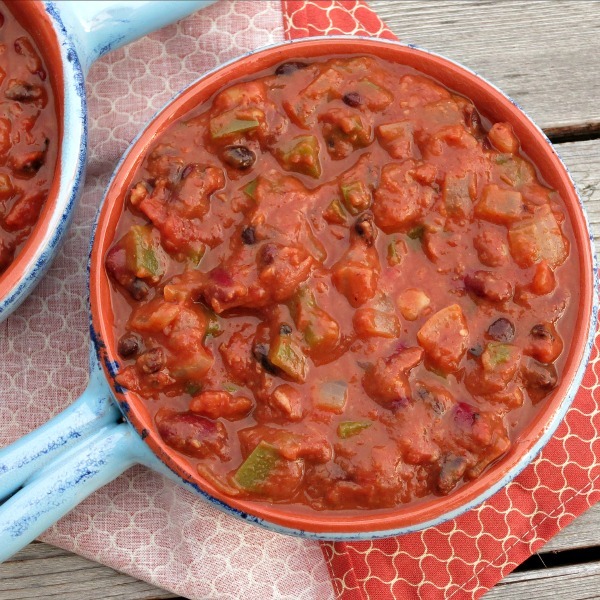 This chili is hearty enough to satisfy meat eaters and vegetarians (and vegans!) alike…due to the addition of the third bean ~ refried beans! The refried beans are an unexpected addition that thickens the chili perfectly and gives it a the nice hearty texture. Combined with the other beans and all of the vegetables and spices, this chili has quickly become a family favorite. While this is not a new recipe to the blog, it was deserving of an update. Since Three Bean Vegetarian Chili is so quick, easy and healthy, I thought it would be perfect to share and kick of this weeks Weekday Supper. Each weekday, one blogger from the group shares a recipe for quick and easy meals easily found in a grocery store. The idea behind Weekday Supper is that Sunday Supper starts as just one day a week…and soon becomes a way of life. Over medium heat, in a 5-quart dutch oven or soup pot, heat oil until smoking. Combine onion, peppers and garlic and add to pot and saute for 3 to 5 minutes to soften vegetables. Deglaze pan with broth, add tomatoes, black beans and kidney beans. Stir to combine. Season chili with cumin, chili powder, hot sauce and salt (if using). Thicken chili by stirring in refried beans. Simmer over low heat about 5 to 10 minutes longer and then serve with desired toppings. Looks great! I’m always on the lookout for more vegetarian ideas! I’m really trying to encourage my Husband to eat a few vegetarian meals a week. 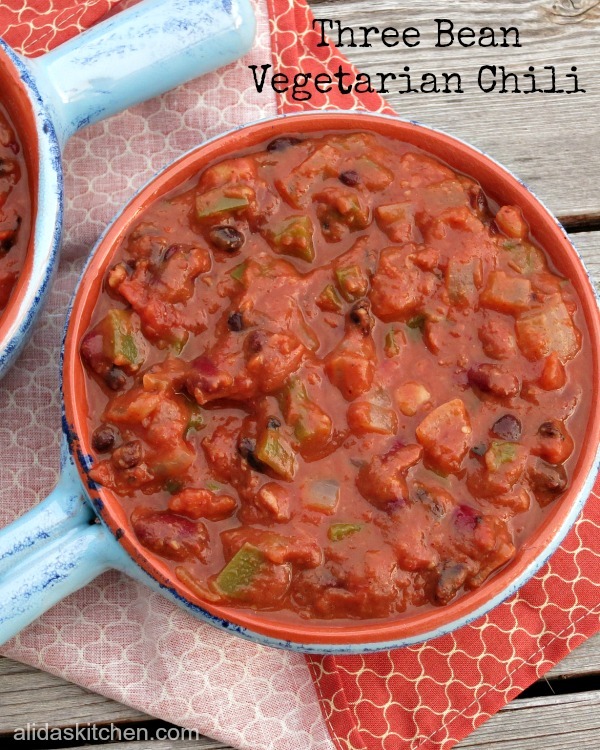 I wasn’t too lucky with the last vegetarian chili I made but will give your incredible looking version a try! What a great idea to thicken the chili with the refried beans, cool. Sounds delicious! Have a great week. Yum, chili! This looks perfect on this cold and grey day!!! will have to try this great recipe! thanks for posting this! Yum! This looks fantastic – warming and healthy! Will definitely be making this soon!